In this tutorial, we will see about Spring @Profile annotation. This tutorial is an extension to Spring boot profile example. By setting the spring.profiles.active property as a JVM system property, as an environment variable, or as a Servlet context parameter in web.xml for web applications. Let’s see with the help of an example. 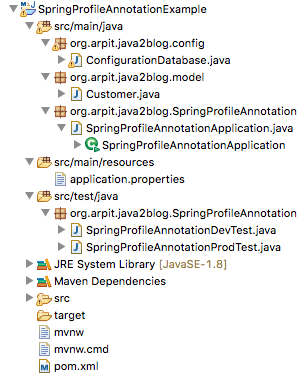 Step 5: Create test class named “SpringProfileAnnotationDevTest” in src/test/java. 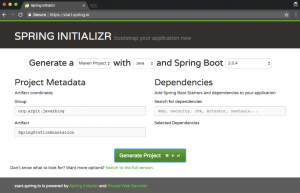 @SpringBootTest annotation is used to run Spring boot test. @ContextConfiguration provides class-level metadata to determine how to load and configure an ApplicationContext for integration tests. @ActiveProfiles is used to provide name of the profile which will be activated while running integration tests. Step 7:Create another test class named “SpringProfileAnnotationProdTest” in src/test/java. As you can see, we are getting different bean based on active profile. Source code for Spring profile annotation example. That’s all Spring profile annotation.